After the eight goal thriller up at Inverurie this third round William hill Scottish Cup Replay had a lot to live up to but the replay on Tuesday evening never got anyway near like producing the same excitement for the fans who braved the weather. The game was settled by a 44th minute Peter Weatherson goal after he latched on to a Steven Black long ball over the top of the Inverurie defence and for once the Inverurie defence got caught wrong footed after previously catching Annan offside on several occasions and Weatherson with a clear run on goal homed in to slip the ball into the net past Scott Mathieson. Ryan Finnie presented the first scoring opportunity to Inverurie when he conceded a free kick from a dangerous location 30 yards from goal but Annan’s tormentor in the first game Neil McLean blasted the ball over the bar and the opportunity was lost. It was the Locos who looked the most dangerous team in the opening spell and Jordan Hart had to be alert to deal with Martin Laing’s 20th minute cross from the right. This was closely followed by another Hart save when he smothered McLean’s 30 yard free kick. Annan were living dangerously and their long ball tactic’s of trying to get the ball behind the well organised Inverurie defence were constantly catching Annan offside. Inverurie almost grabbed a shock lead in the 25th minute when Martin Laing’s dangerous cross deflected off Bryan Gillfillan and went narrowly past the post. It was a fortunate break for Annan but they threatened the Inverurie goal for the first time minutes later when Martin McNiff’s effort went past the upright from a Weatherson lay off. As the game entered the final ten minutes of the half Annan started to enjoy their best spell and Flynn’s effort was blocked with Weatherson’s effort slipping past the post. Then came the defining goal when Black turned defence into attack when his long ball was superbly read by Peter Weatherson who latched on to the through ball to score another vitally important goal in his much travelled career. It turned out to be the only clear cut chance of the half. Annan started the second half with more promise, Flynn’s near post cross was collected by Mathieson and moments later the keeper easily dealt with Flynn’s low shot. Osadolor’s 63rd minute shot was deflected for a corner as Annan pushed to double their lead. Ryan Finnie’s dangerous cross to the back post almost was well intended with Flynn just failing to connect. This was followed by a superb Weatherson effort which pulled out a good Mathieson save. McColm was introduced for the ineffective Osodalor in the 73rd minute and he almost made an immediate impact skying over the bar from the edge of the box. The last 15 minutes saw Inverurie pushing everything forward as they tried to unlock the resolute Annan defence and in the 83rd minute a long free kick found the head of Daniel Crisp and somehow Hart managed to pull off a superb save to tip the ball onto the bar and from the ensuing malee Annan somehow cleared the ball from the goal-line. At the other end Finnie sent in a dangerous cross and minute later Weatherosn uncharacteristically blasted the ball over the bar from a free kick on the edge of the box. Hart almost got caught when he misjudged another free kick with the ball going narrowly past the post. 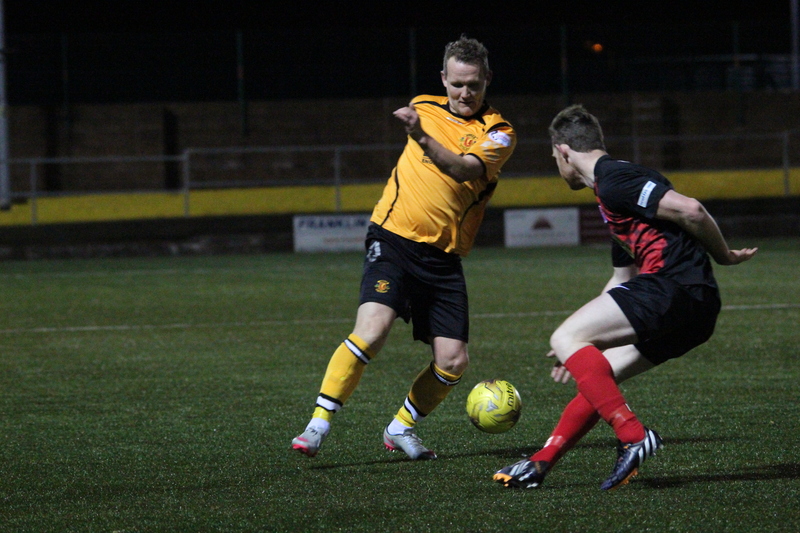 This was followed by a superb Gordon Forsyth 30 yard effort which crashed off the crossbar. Annan were living dangerously but they saw the game out to set up an interesting fourth round home tie against Premier League Hamilton Academicals on Saturday 8th January. Annan boss Jim Chapman praised the effort of his team, “It was a difficult match against a well organised and competent team. We are going through a trying time at the moment but the team are showing another side to their make up, they are difficult to beat and they are seeing matches out. They are not top of the league through luck it is all about hard work and a determination to win, last year we would have struggled to win this tie. This cup tie has produced a welcome break from the rigours of the league but now we must get the players focused and prepared for Saturdays home League match against East Stirlingshire. ANNAN ATHLETIC – Jordan Hart, Steven Black, Steven Swinglehurst, Martin Mcniff, Peter Watson,Steven Sloan, Ryan Finnie, Matty Flynn, Peter Weatherson, Bryan Gillfillan, Smart Osadolor ( Stuart McColm 74 min). Subs not used Blair Currie, Rabin Omar , Greig Mcdonald, Jamie Watson, LiamPark, Josh Todd .